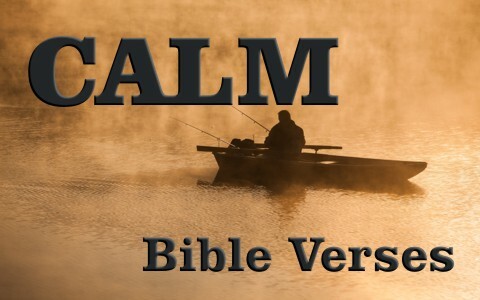 Here are eight Bible verses about being calm. This Bible verse is reminiscent of when “Shadrach, Meshach, and Abednego, fell bound into the burning fiery furnace” (Dan 3:23) and then the king and his guards saw “four men unbound, walking in the midst of the fire, and they are not hurt; and the appearance of the fourth is like a son of the gods” (Dan 3:25). They were astonished as “the satraps, the prefects, the governors, and the king’s counselors gathered together and saw that the fire had not had any power over the bodies of those men. The hair of their heads was not singed, their cloaks were not harmed, and no smell of fire had come upon them” (Dan 3:27). This may have been a preincarnate appearance of Christ, but the point is, God may not keep us out of the fiery furnace, but He’ll be in there with us. God’s Spirit should give us a sense of calm because we’ve had the wrath of God removed from us through Christ. We are not at peace with God because the condemnation has been lifted (Rom 5:1, 8:1). We have the peace of God because we’re at peace with God. This peace came through Jesus as it was “upon him was the chastisement that brought us peace, and with his wounds we are healed” (Isaiah 53:5b) since “he was pierced for our transgressions; he was crushed for our iniquities” (Isaiah 53:5a). When the disciples and Jesus were on a boat in the middle of the sea, “a great windstorm arose, and the waves were breaking into the boat, so that the boat was already filling. But he was in the stern, asleep on the cushion. And they woke him and said to him, ‘Teacher, do you not care that we are perishing’” (Mark 4:37-38)? Jesus immediately commanded the storm “Peace! Be still!” and instantly there was no wind and a “great calm” which would mean the sea was like glass. After this, the disciples “were filled with great fear and said to one another, “Who then is this, that even the wind and the sea obey him” (Mark 4:41)? Jesus knew the storm was coming, yet He sent the disciples into it and He may do the same to us! The point is, Jesus went with them through the storm and then He calmed the storm for He is sovereign over the storm (and all things!). The author of Hebrews, as if almost being aware of Jesus’ teaching in Luke 12:4-5 (and may have well been aware of it! ), writes “It is a fearful thing to fall into the hands of the living God” (Heb 10:31), but never is it said anywhere to fear falling into the hands of men. Jesus showed that falling into the hands of men brought about much good (John 3:16), so this physical life is unworthy to compare with the eternity that’s coming (Rom 8:18). What is the worst thing that could happen? You could be killed for your faith or just by accident or someone killing you. They would only speed up your being with the Lord, and I seriously doubt that the person that’s with the Lord would want to come back to this world if given the chance. This Bible verse almost seems to be a prophecy of Jesus calming the storm on the sea (Mark 4:35-41) but it is more about the God Who has omnipotence or all-power as He can calm the water and rebuke the waves and since “He made the storm”, He can make “the storm be still.” You can trust God. Who else can command whatsoever He wills. Who can tell Him otherwise? This ties in with what James wrote (1:19), “Know this, my beloved brothers: let every person be quick to hear, slow to speak, slow to anger; for the anger of man does not produce the righteousness of God.” Every time Jesus got angry, it was a righteous indignation, and He did not sin in this, but this same anger “does not produce the righteousness of God” in us and we often give the devil a foothold (“opportunity”). Being angry at the things that God is angry at is fine, but make sure to “Repay no one evil for evil, but give thought to do what is honorable in the sight of all. If possible, so far as it depends on you, live peaceably with all. Beloved, never avenge yourselves, but leave it to the wrath of God, for it is written, ‘Vengeance is mine, I will repay, says the Lord’” (Rom 12:17-19). Jesus was about to go to the cross and leave the disciples for a time and they were deeply troubled about it so Jesus reassures them, “I will not leave you as orphans; I will come to you” (John 14:18). Furthermore, He says “Peace I leave with you; my peace I give to you. Not as the world gives do I give to you. Let not your hearts be troubled, neither let them be afraid” (John 14:27). Those words should have comforted His disciples and gave them peace about things but Jesus would say the same things to us who are in a season of doubt and fear, “Let not your hearts be troubled. Believe in God; believe also in me” (John 14:1). Where there is trust, there is peace…and calm. This verse places the burden of our reaction on us. We can choose to remain calm when everything around us is caving in. Calmness is powerful when there is a great tempest in the oceans of life. Remaining calm can “lay great offenses to rest.” The ruler in your life might be your boss. You might get in deep trouble at work because of something you did or something you refused to do because it would be a sin. Solomon’s counsel is “do not leave your place” or hold your ground but remain calm. That’s a powerful antidote for putting to rest much trouble. Calmness is like a tranquilizer to anger. Whatever you are going through right now, there is a calm we can have in knowing Christ. We know that we shall see Him someday (Rev 21:3; 22:4), and we know that death can’t separate us from God (Rom 8:38-39), and so just like Shadrach, Meshach, and Abednego, we can say, “we have no need to answer you in this matter. If this be so, our God whom we serve is able to deliver us from the burning fiery furnace, and he will deliver us out of your hand, O king” (Dan 3:16-17). That’s because we don’t have to fear those who kill the body (Luke 12:4-5), but only fear God, which is true wisdom and gives us calmness in a series of storms.